1911 was Frank Standbridge, killed in action in August 1916. Archibald's Medal Index Card shows he entered France on 12th February 1915 whilst serving as a Private in the 10th Liverpool Scottish. He was seriously wounded on 31st March, 1915. After recovering from his wounds he spent 12 months "instructing". 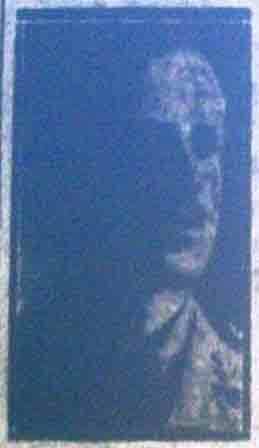 According to The Buxton Advertiser (13th January 1917) he next went to Egypt with the Royal Flying Corps. Reporting that he was home on leave for a few days before leaving for Egypt, it was stated that he had been promoted to Lieutenant (from 2/Lt.) in September 1916, and transferred to the R.F.C. in October. Since then he had been in ".. strict training at ----- ..." and ".. had gained a special certificate from the School of Military Aeronautics. He now holds four first class certificates for the courses he has gone through." The article closed with the wish that Archibald would have a successful career and return to Buxton safe and well. 'The Buxton Advertiser' (21st September 1918) gave the reason for Archibald's transfer from the Royal Flying Corps as ".. for physical reasons had to relinquish that Service". On the 18th January 1917 the 2nd Battalion The Loyal North Lancashire Regiment moved to Egypt, landing at Suez, and on the14th April 1917 were attached to 232nd Brigade in 75th Division. The Battalion was moved in rapid succession to the 233rd and 234th Brigades of the same Division, and then detached as a result of a medical board on 9th August 1917. They then proceeded to Sidi Bashr and then placed onto Lines of Communication at Gaza. 'The Buxton Advertiser' said that Archibald was " .. one among the many who was instrumental in the taking of Jerusalem." Assuming Archibald was attached to the South Lancs Regiment after then he would have joined the 57th Division, which towards the end of the War were engaged in The Battle of the Scarpe (26th - 30th August); The Battle of the Drocourt-Queant Line (2nd -3rd September) - phases of the Second Battles of Arras 1918. When reporting Archibald's death, 'The Buxton Advertiser' (21st September 1918) confirmed the location as ".. on the Queant line." The account went on: "Though a Reserve Officer, having served in five Regiments, he nevertheless had the honour of being given a commission unsought in the Regular Army." 'The Washington Post' (4th September 1918) reported that: "The capture of the town of Queant, the southern support of the famous German switch line before Cambrai and Douai is announced in an official statement from Field Marshall Haig today. In storming the Drocourt-Queant Line the Canadians assisted the English troops and carried everything before them. Along the line the enemy was heavily defeated in his prepared defences and is retiring on virtually the whole battle front." Archibald was one of just four killed from his Battalion on the 9th September 1918, and the only one buried in Reninghelst Cemetery. working as a "Railway Clerk". Albert died in the Buxton, in the September quarter 1969. 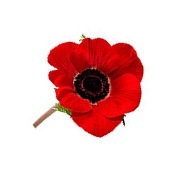 · His other brother Jeffrey Sydney LINAKER, born 9 November 1899, enlisted in the Royal Flying Corps (R.A.F. from 1918) on 3 September 1917. List, whilst working as a Railway Clerk, living on St Peters' Road, Fairfield. Geoffrey died in Buxton in the September quarter 1964. Geoffrey's Service Papers are available from the National Archive - Ref: AIR 76/300/61. Reserve Battalion). NA reference WO 339/34091. 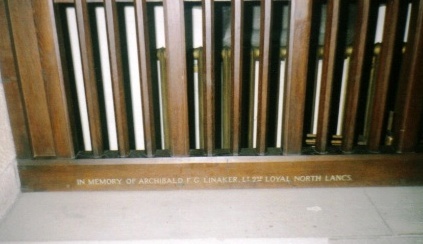 · I am grateful to British War Graves for the photo of Archibald's grave.